$0.99 (regularly $9.95) 7/20/2016 - 7/22/2016! If you are interested in deepening your emotional awareness and in developing your emotional intelligence in ways that enhance conscious co-creative living, then this book is for you. It is a drop of peace in the ocean of our busy lives. --> Do you understand the role that your emotions play in your capacity for free will and conscious living? --> Are you interested in the power of conscious choice? --> Do you feel as though you are in charge of the decisions that you make in your life, of navigating your own journey? 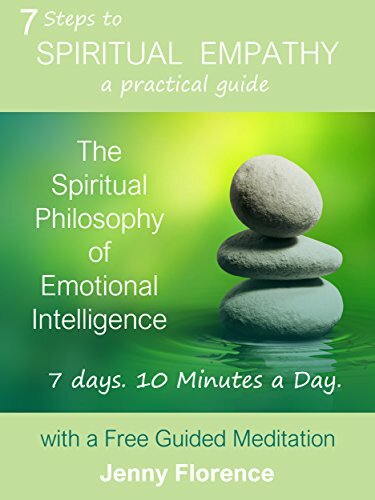 Designed to be read in just 10-15 minutes a day for 7 days, this deeply philosophical and highly transformational book guides readers through a 7-day journey of emotional discovery and expanding spiritual relatedness. Each day, practical and pragmatic suggestions integrated with emotional insight deepen our understanding and awareness of the way in which empathy sits in relationship with spirituality and emotional intelligence, supporting us in enriching the quality of our personal well-being, our relationships and our everyday lives. Our emotions sit at the core of our ability to build successful, healthy relationships in all areas of our lives. They play a key role in our self-development and in our ability to navigate our lives through conscious choice and conscious intention. Empathy isn’t simply a listening ear and something that we can offer others. In essence, true empathy is a state of being; a way of living that opens a pathway of spiritual relatedness with life itself. Spiritual empathy transforms our ability to relate with our full experience of life at a level of mindful and conscious awareness; awareness of ourselves, of others, and awareness of a greater, universal intelligence of which we are an integral and dynamic part. This is the first in a series of books about the intelligence of our emotions, each written to support and enable deepening layers of relational growth and understanding. Florence invites readers on a journey of self-discovery, beautifully combining conceptual knowledge of emotional intelligence with practical and pragmatic application. The format of the book is deliberate. Its bite-sized chapters make it accessible, easy to read and translatable into a kind of emotional toolkit that can pragmatically help to integrate emotional awareness into daily living in ways that will enhance all aspects of who we are and who we wish to become. Drawing on her extensive experience as a therapist, Jenny Florence’s books are a journey of self-awareness, connecting the intelligence and creative capacity of our mind with emotional knowledge and understanding. She has a unique ability to talk about the complexities of our mind and emotions in a language that is accessible and without jargon. Jenny has worked as a counselor and therapist for over 25 years, having trained in a variety of therapeutic modalities. She has listened to people of all ages, men, women, couples and individuals, each one unique and individual, on their own unique and individual journey. In her experience, she has determined where the majority of us, herself included, seem to struggle most in our lives is intrinsically connected to our emotions. Our childhood, families, relationships, life events and everyday happenings all leave their mark, and that mark is an emotional one. Our emotions are a powerful, human commodity. They can be our strongest, most supportive ally or they can disable us, leaving us feeling blocked, out of control and in pieces. Jenny believes it is our ability to listen and decide that will make the difference between a breakthrough or a break down.